Add a charming rustic light to commercial displays with the 12" Barn Light Shade and gooseneck arm extension. Fixtures have a heavy duty all-aluminum construction with rust resistant powder coated finishing. 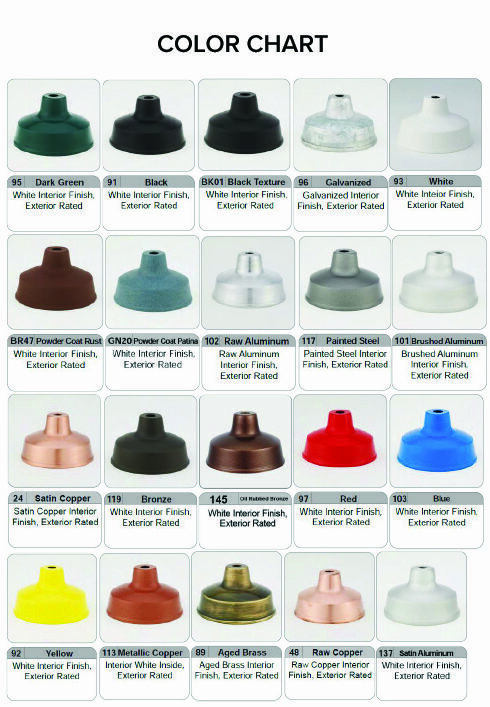 Choose from 25 attractive finish options, including natural metal tones and bright colors (additional cost may apply). Accessories like wire guards and decorative glass globes are also available to add on for true rustic lighting charm. Outdoor Barn Lights display well in multi-fixture arrangements for sign and awning lighting. Cast aluminum back plates have mounting holes at 3 1/2" on center to allow easy installation to a standard 4" round or octagonal junction box. Standard lamping is incandescent with 100W bulb maximum; upgrades to MH and CF gooseneck lighting also available online. Please call for high pressure sodium or LED options.